The aging process has been on my mind. I celebrated a relatively major birthday this week and tomorrow my eldest daughter gets bat mitzvah'd. While enjoying these kinds of events is the positive side of growing older, there is a negative side as well, which was brought home to me by the news of Adam Yauch's passing earlier today. 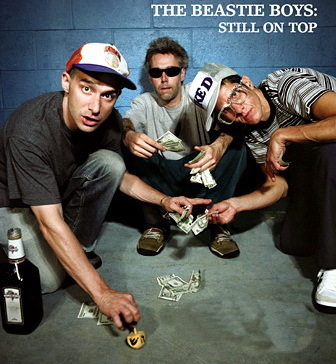 It will probably surprise no reader of this blog that the Beastie Boys are one of my all-time favorite musical acts. Indeed, the photo above (from Heeb magazine) is framed above my desk at home. I've yet to read an obituary, but I'd be surprised if most of the tributes don't make reference to the remarkable arc of Yauch's public life: from boorish and hedonistic teenage behavior to thoughtful political action as an adult. Yauch and the rest of the Beastie Boys aged much more gracefully than anyone could have imagined back when they first emerged in the mid-1980s and were dismissed as one-hit wonders. I'm sorry that we won't get a chance to see a third act from Yauch given how remarkable his first two were.